The beautiful Meesapulimala can be enjoyed during a beautiful 8 kilometer trek which can be taken from the Rhodovalley. Meesapulimala is 15 kilometers from Munnar. It offers breathtaking view of the grasslands, wildlife and rainforests from a high altitude. The name of Rhodovalley was derived from the red Rhododendron trees that give the place a pleasant red color. 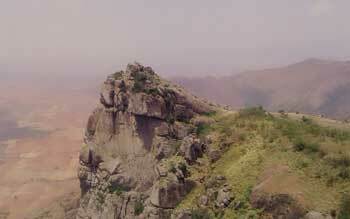 Meesapulimala is the second highest peak among the Western Ghats in Idukki district of Kerala. It got its name from the way it is formed in the eight peaks which stretch like a moustache and located between the Anaimalai Hills and the Palani Hills. During the trek before reaching the seventh peak, one is likely to spot the wildlife which serves as an additional energetic boost during the trek. Near the end of the trek, one is greeted by the sight of the Meesapulimala peak which offers a spectacular view that is assured make anyone, tired, feel refreshed. October to February is the best time to visit Meesapulimala. During summer, the view is devoid of fog and gives a clear view. Illikal Kallu, Vagamon, Barren hills, Vagamon Pine forest, Sunny’s gramophone museum and Elaveezhapoonchira. By Air : The Cochin International airport is the nearest airport. By Train : The nearest railway station is the Theni railway ststion which is 60 kilometers away and Aluva station which is 110 kilometers away. By Road : The trek starts from Munnar where a jeep takes the trekkers over to the base camp from where its all on foot.